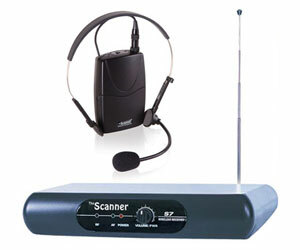 Comprising a headset microphone transmitter, VHF receiver, audio lead and power supply, connecting the system takes literally seconds. With only the Gain and Squelch controls to adjust – if needed – the H7 Headset Microphone System offers crisp, detailed vocal performance with complete reliability. Even battery performance can be checked at any time during use by continuous LED status on the microphone unit. Offering a typical 50m operational range, depending on the environment it’s used in, THE SCANNER H7 RADIO HEADSET MICROPHONE SYSTEM is a fabulous way to experience all the advantages of a wireless microphone system.The packaging also doubles up as a carry case.